Indianapolis is a sports city. We have our Pacers and our Colts and our checkered flags, so it’s no surprise that our golf scene is really quite respectable. Arnold Palmer once said, "Golf is deceptively simple and endlessly complicated; it satisfies the soul and frustrates the intellect. It is at the same time rewarding and maddening - and it is without a doubt the greatest game mankind has ever invented.” Well said, Arnold. He, of anyone, would certainly know. So if you’re longing for some time in pursuit of a maddening reward of your own, here are some of the premiere courses in Indianapolis. The Fort Golf Club in Indianapolis at Fort Harrison is another on the Pete Dye Trail. Surrounded by trees and beyond scenic, this course is sure to cure what ails you. Twin Bridges - This Danville 18 hole, par-72 course is open to the public and is one of the top rated courses in the state. Ranked by Golf Digest and voted best in it’s county two years running, this tranquil course is not one to miss. You can book your tee time online here! Hickory Stick - A course with a great aesthetic, challenging but playable terrain and uniquely laid out by designer Tim Liddy, your 18 holes will not disappoint. Located in Greenwood at 4422 Hickory Stick Blvd, go online for rates and tee times. Purgatory - Named number one in Indiana by Golf Week magazine, this Noblesville course is as entertaining as it is challenging. 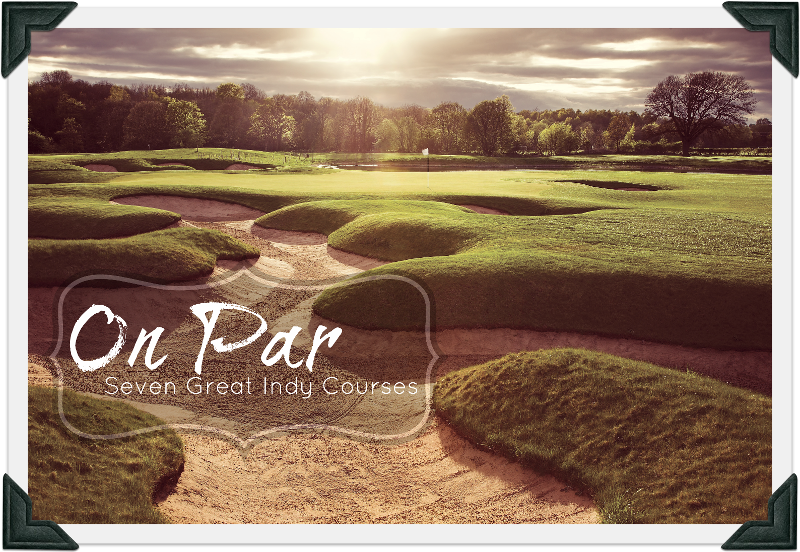 At Par-72 and spanning 218 acres, it is the longest in the state and as the name implies, is not for the faint-of-heart. If people generally insert “Bogey” between your first and last name, you might consider some time at the driving range before attempting to conquer Purgatory. But, if you think you’re up to the task, you’re in for a treat, as the course features a host of great amenities, such as on-course restrooms. In this, their “more heaven than hell” slogan seems rather apropos. Visit them here for more info. Next on the list, we have Eagle Greek Golf Club. Eagle Creek Golf Club is situated at 8802 W 56th St. Indianapolis, IN, just a short drive from downtown. They are offering 36 holes designed by Pete Dye. Another healthy challenge of a course, you can expect to put your skills to the test with hilly terrain and some tough water holes too. Of course, Brickyard Crossing should not be missing from the list. Ranked as one of the Top 100 Golf Courses in the Country and seated smack-dab in the middle of the Indianapolis Motor Speedway, Brickyard Crossing is the true Indianapolis golf experience. Last, but not least, we have Saddlebrook Golf Course at 5516 Arabian Run Indianapolis, IN. A course well-known for their tree lined, par-71 course. About his game, the great Arnold Palmer also said, “The more I practice, the luckier I get” ...and he would know about that, too. So what are you waiting for? Fall is the perfect time to put on your plaid pants, polo shirt and a visor and go find yourself some luck on the links!